About Us:We're Cat Loving artists creating Gifts for Cat Lovers. 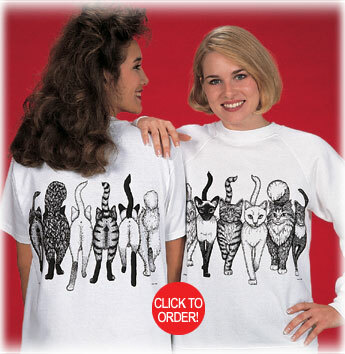 Since 1986 our passion for kitty cats has driven us to create the most fun fashions for feline fanciers! In 1986, I created the cat T shirt design "Cats Coming and Going." This front and back "Cat Butts" design evolved into the Hep Cat Catalog, a collection of unique gifts for cat lovers. It featured fashions, designed by myself and other cat loving artists, cat apparel and clothing for cat lovers such as cat T shirts, sweatshirts, and nightshirts. At this time our business was known to the cat loving public simply as "Hep Cat". Over the years a plethora of unique cat themed gifts were added. Over the years, I've had the honor to work with amazingly talented artists, like Tanya Whitley and Michael Cressey. I love to offer items that are created by real cat loving artists like the incredible Tyber Katz. ~Being a feline fancier myself, I know what cat lovers treasure: high quality, unique, cat-themed items. In 2009 we shifted from mailing a catalog to being 100% online. It is such a delight for me to offer those great cat products right here, online. I'm passionate about cats AND about creating "raving fan customers." I guarantee you'll be 100% satisfied or your money back! to hearing from you! Meowy Shopping! Click here to meet our Feline Officers! Why Hep Cat Shirts are the BEST: WE use only the best highest quality shirts and we never, never, NEVER, use transfers or transfer processes. These transfer shirts might look good at first and are definitely cheaper to produce but a shirt which is screenprinted with ink placed directly on the fabric, look better longer, even for years to come. This is how Hep Cat creates its cat designs. We use great art, award winning screen printers like Anderson Studio of Nashville TN, and high quality heavy weight garments. We also offer our "Purr-fect" guarantee. You must be 100% satisfied or we will exchange your item or refund your money if you return your item within 14 days. All graphics/images on this site are copyrighted. Reproduction is strictly forbidden by law. Warning: Hep Cat® and MEOW.com™ enforce our copyrights vigorously!